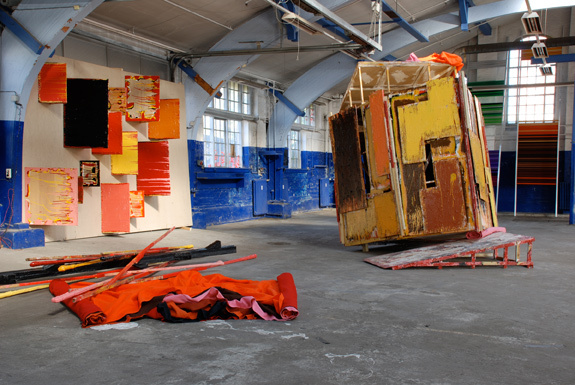 Phyllida Barlow is the third artist selected for a Recognition of Art by Women (RAW) exhibition and is the first sculptor to be included. Barlow’s sculptural practice centers on her attention to, and experimentation with, materials that are easily overlooked and most often found in the urban environment in which she lives. Cardboard, fabric, plywood, polystyrene, wire netting, scrim, and cement are among favored elements she manipulates to create sculptures that defy simple description; but, are memorable for their presence. Barlow describes her work as “anti-monumental,” and defines the term as “seeing the monument as a kind of absurdity – because so often we don’t know what the monument is. We’ve lived through a decade where we’ve seen it literally topple in front of our eyes.” Several new sculptures and others seen only in Europe comprise this exhibition. Recognition of Art by Women is made possible by the Leonard and Sophie Davis/MLDauray Arts Initiative. Oui, ses installations sont absurdes, mais ils peuvent enflammer son imagination aussi.